The product redesign includes a number of improvements. For starters, its ladder-style, open frame design replaces traditional perforated bedplates that allow better airflow through the frame for cooling and water and chemical drainage applications. Its sleek, narrow profile means it can be positioned under machinery and in other tight spaces where other conveyors wouldn’t fit. Another enhancement to the frame is a Universal T-slot that is compatible with industry-standard hardware and makes attaching accessories and guiding fast and simple. The optional high-speed nose bar transfer option allows for safe and efficient transfers of small parts at speeds up to 175 feet per minute. The conveyor also comes with two styles of plastic chain belting: micro pitch, general purpose modular belt, or a metalworking modular belt (1” or 2” cleats are available on the metalworking modular belt). End drive models are compatible with Dorner’s new Universal Drive – a universal motor and mounting package that covers all speeds, loads and mounting positions with a single part number. The 2200 Series Modular Belt is the third of four new platforms being introduced this year as part of Dorner’s newly redesigned 2200 Series platform. In April, Dorner re-launched the original 2200 Series to include new features such as a redesigned frame, additional belting and expanded guiding to make the platform stronger, faster and more flexible for handling small to medium size part applications. The 2200 Series LPZ, which comes with one or two pivot points, launched in June as the second conveyor in the newly redesigned series. The fourth and final conveyor in the series is expected to debut later this year. All of Dorner’s 2200 Series conveyors can be configured in Dorner’s Online Configurator, DTools. Users can engineer a complete conveyor and download a complete 3D CAD assembly model for instant validation of fit. 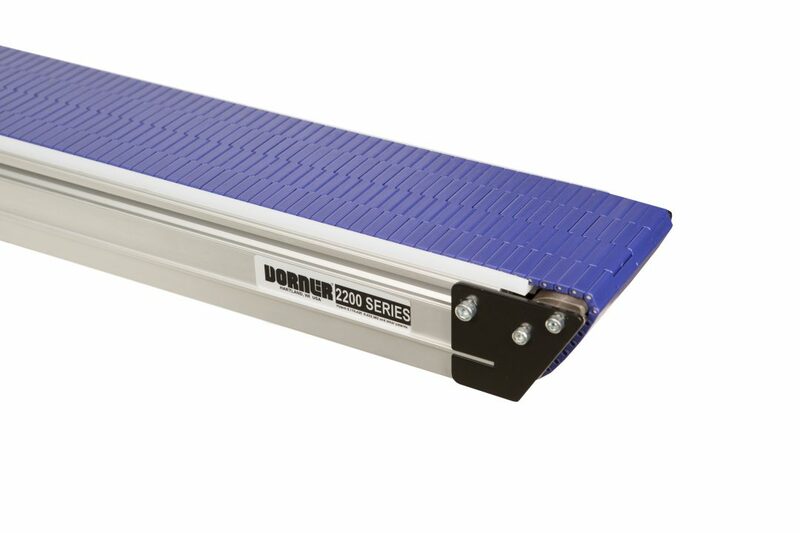 For more information on Dorner’s new 2200 Series Modular Belt conveyor, visit the Product Page.